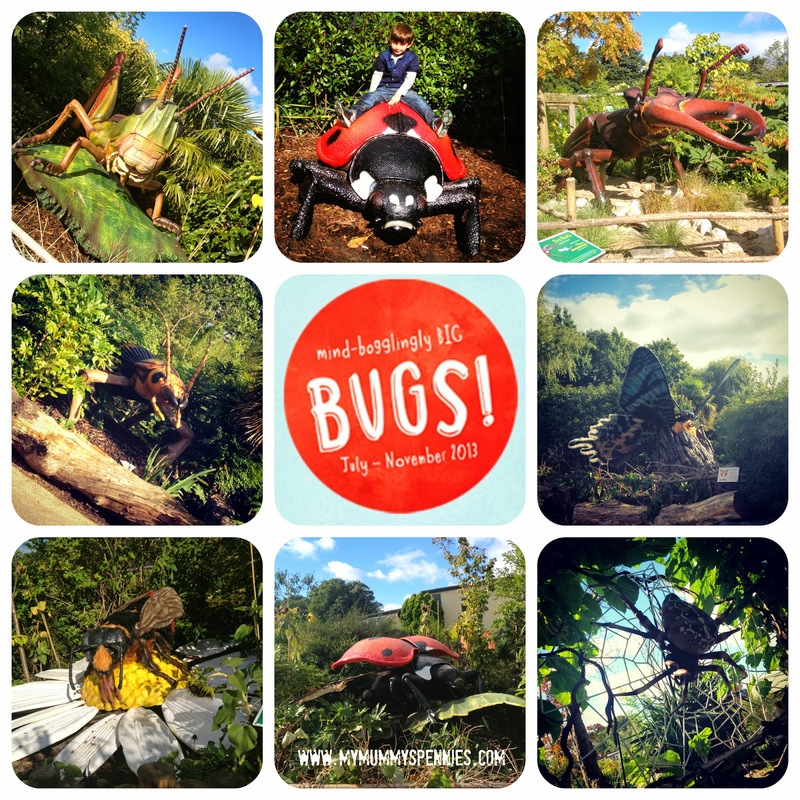 Soon though it was time to enter the Zoo and after watching the Elephant family come out into their enclosure, we headed towards the BUGS exhibition, which was really quite fun and interactive although beware if you have a fear of creepy crawlies! Ben was unfazed and enjoyed having a ride on a giant ladybird! Other #Matalanzooday bloggers soon arrived and we all met up at the chimps, it was great to see some good friends including the very lovely Sim from SimsLife and Pippa from RedRoseMummy, who we continued to explore the Zoo with. We soon had a break for a yummy picnic lunch near the play area before going on to visit the Ape house, which had lots of delightful sights including a Mummy ape showing off her Baby to the crowds, it was lovely to watch and she was obviously so proud! It was a really fun day out, it's been over a year since we last visited and both children were much braver and more excited this time, running about and following Bud who was the self appointed map-reader for the day! 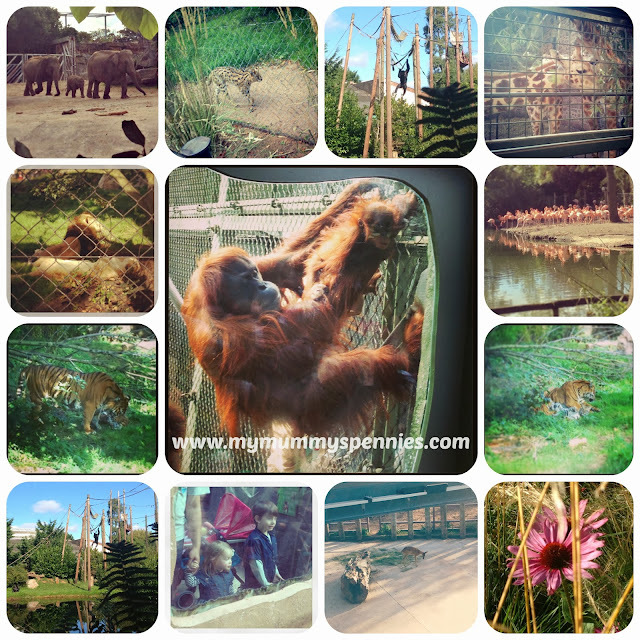 It was loudly announced that their favourite animals were the monkey's, Giraffes and Elephants, although Ben was fascinated by feeding time at the Giant Otters too, I just wish we had battery life left to take some pictures, I guess I was too snap happy earlier on! Prior to the day, the lovely folks at Matalan sent us some vouchers to kit the children out in their latest clothes for the day. I was spoilt for choice looking though all the lovely girls clothes but eventually decided on this pretty Chambray Dress for just £12 with the gorgeous Red Cape that was a bargain at £14, the outfit is adorable and as well as looking fabulous at the zoo, the outfit will be well used over the winter. I have to say that they boys choice was slightly lacking compared to the girl's however I soon found this shirt & Tshirt set for £7, which looked very smart with these rather funky jeans that were just £13. Two really cute and great quality outfits that I am really pleased with. How cute is that Cape? I wish they did it in my size! 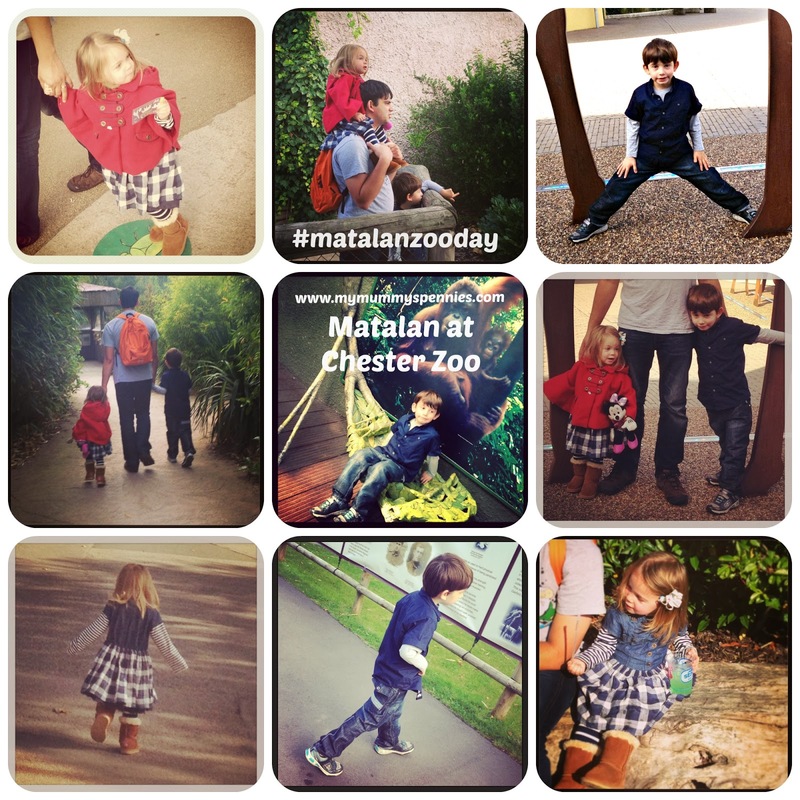 I'd like to Thank Matalan and my fellow Bloggers for a great day out! Disclaimer: Matalan kindly paid for our family to gain entry to the zoo and gifted us £40 of vouchers towards the clothes we purchased. It was a fab day wasn't it? Nice to just wander around the zoo rather than haring around trying to see everything. L is wearing her cape most days at the moment, I can't bear to put it away for smarter occasions. looked like you had a fab day out! loving the baby elephant!! Those bugs would scare the bejesus out of me! I have a small flying things phobia and that would be hell! Wonderful photos of the baby elephant and orangutans! Nipping over from the blogsRus share thread. I love what you did with the photos! I would love to know how you did it ;) Sounds like a really great day out! Thanks so much! I'll have a look into it. Your little girl looks adorable - and so on trend in this season's tartan - a fashionista in the making! I've not been to chester zoo in so long!